Unionists across Victoria joined a week of action in support of refugees in early May. Inspired by the success of the Teachers for Refugees t-shirt actions in December, nurses, librarians, health workers and university staff all staged their own actions. 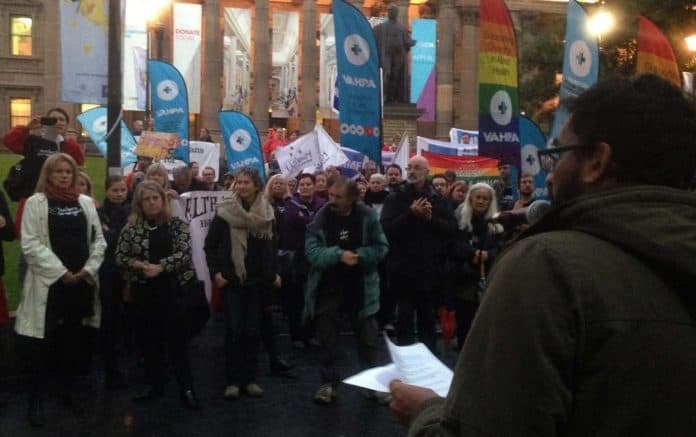 Around 200 people attended a vigil on the Tuesday night, including nurses from at least four hospitals and workplaces. Teachers at 20 new schools which had not taken part in previous workplace actions donned the pro-refugee t-shirts demanding “Close the camps, Bring them Here”. As in December, teachers were condemned by Federal Education Minister Simon Birmingham and faced pressure from the Victorian Education Department not to wear the t-shirts in schools. In at least four schools teachers wore them into class in defiance of directives from their principals. Elsewhere, t-shirts were worn in classrooms with the permission of principals. There was an increased level of defiance this time, as not a single teacher has received a formal reprimand for wearing a t-shirt, despite the right-wing media campaign in December. 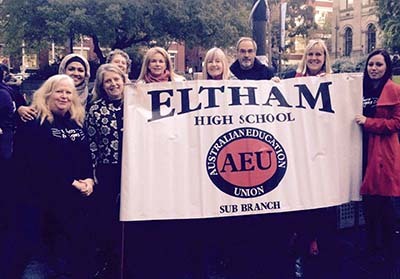 Teachers were again supported by their union, the AEU. The nurses’ union, the Allied Health Association, Health and Community Services Union (HACSU) and the NTEU all produced their own refugee t-shirts for members. Librarians for Refugees also held their own photo actions at RMIT and Melbourne University libraries. Workplace actions are a key way to spread the pro-refugee message deeper into local communities, combat the government’s fear campaign and build the momentum for change. The action at the Lady Cilento hospital in Brisbane last year, where health workers refused to release baby Asha and her family for return to Nauru, show how workers’ action can also directly disrupt the detention policies. Teachers in NSW are holding their own week of action at schools during refugee week in late June.